Lawrence Eagleburger was appointed Secretary of State on December 8, 1992, and continued in that position until January 19, 1993. Eagleburger’s tenure as Secretary capped off a distinguished 27-year career with the Department of State. Born in Milwaukee, Wisconsin, on August 1, 1930, Eagleburger earned a bachelor’s degree from the University of Wisconsin in 1952, before serving as a First Lieutenant in the United States Army from 1952 to 1954. Following his army years, the future diplomat returned to his alma mater, where he earned a master’s degree in 1957. Upon graduation, Eagleburger joined the Foreign Service and served as a political analyst for Cuba before being sent to Yugoslavia, where he was assigned to the U.S. Embassy’s economic section from 1961 to 1965. He also worked as a National Security Council Staff member from 1966 to 1967, and as Special Assistant to the Under Secretary of State from 1967 to 1969. During the Nixon administration, Eagleburger held a number of roles, including Executive Assistant to the President’s Assistant for National Security Affairs (1969), Political Adviser and Chief of the Political Section of the U.S. Mission to NATO (1969-1971), and Deputy Assistant Secretary of Defense (1971-1973). He was then named Deputy Under Secretary of State for Management from 1975 to 1977, before President Jimmy Carter appointed him Ambassador to Yugoslavia from 1977 to 1981. Eagleburger continued to rise within the ranks of the Department of State during the Reagan and Bush I administrations, serving as Undersecretary of State for Political Affairs under President Ronald Reagan and Deputy Secretary of State during President George H.W. Bush’s tenure. When James Baker left his post as Secretary of State in August of 1992 to lead President Bush’s reelection campaign, Eagleburger took over the Department of State as Acting Secretary of State until the President gave him a recess appointment as Secretary of State on December 8, 1992. Eagleburger’s career service over the years gave him invaluable experience and knowledge in many important areas of U.S. diplomacy. Most notably, the time he spent in Yugoslavia led him to become President George H.W. Bush’s primary advisor during Yugoslavia’s disintegration following communism’s demise in Eastern Europe. Eagleburger’s role as an advisor on Yugoslavian affairs was not without controversy. He gained a reputation as a strong Serbian supporter and denied that there had been atrocities committed in Croatia. As the Department’s second-highest ranking official prior to taking over the Secretary’s position, Eagleburger also played a key role during the First Persian Gulf War. 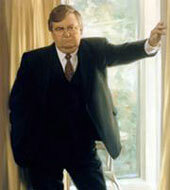 In his retirement, Eagleburger remained a strong voice on international and political issues. In 1998, he became chairman of the International Commission on Holocaust-Era Insurance Claims, which worked to resolve unpaid insurance claims for Holocaust survivors. He also contined to comment on U.S. policy toward the Middle East and served on the Iraq Study Group. Commissioned to the Socialist Federal Republic of Yugoslavia. Commissioned during a recess of the Senate. Served as Acting Secretary of State, Aug 23-Dec 8, 1992.